Sawayama Group, Providing quality, reliable service for over 130 yearsFirst established in 1885 by appointment of the Japanese government our company build. In 1933, Sawayama Family started Sawayama & Corporation Ltd. I was honored to follow in Sawayama Family’s footsteps as company president to continue our long standing tradition of providing quality service. We appreciate and thank you for your continued support especially during these times of our economic downturn. We at Sawayama & Co., Ltd. are dedicated to further expanding our business capabilities to better serve you our loyal customers. 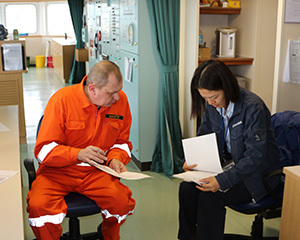 For various vessels’ safety call to Nagasaki, we are providing high quality services for application and smooth Cargo Working. We have experienced maritime business over 130 years in here, Dejima, where was the only one Japanese opened port to trade foreign countries in Edo period, and so many foreign culture has spread throughout to Japan from here. Nagasaki, famous for international tourism city, has always welcomed various types of vessels entry. As a professional independent shipping agency, Sawayama & Co., Ltd has been working with over 100 companies including overseas’ clients. As one of historical customs broker in Japan, we will help you your business fast and accurate. We understand that international trading business has lots of risks and more complicated. We have handled various types of goods to obtain or notify clearance from Japan Customs more than 100 years since qualified. Our CEO, Seiichiro Sawayama, not only as our company president, but also as President of Nagasaki Customs Brokers Association, or as Trustee of Japan Tariff Association, has making effort for economic growth in Nagasaki. Call us. Our experts will help your business. From Nagasaki to the World, from the World to Nagasaki, with your business. Please contact us in having you call about the inquiry, or filling in a matter more necessary than the following form. Copyright © 2015 SAWAYAMA & CO., LTD. all rights reserved.